Dry eye post-LASIK is a very complex entity. Tears are complex, consisting of three layers: At the bottom is a mucin layer, which helps tears adhere to the cornea. At top is an oily layer that helps prevent evaporation. In between is an aqueous layer, the actual watery component of tears. Meibomian glands line the inner surface of the upper lid, and secrete the oily layer. 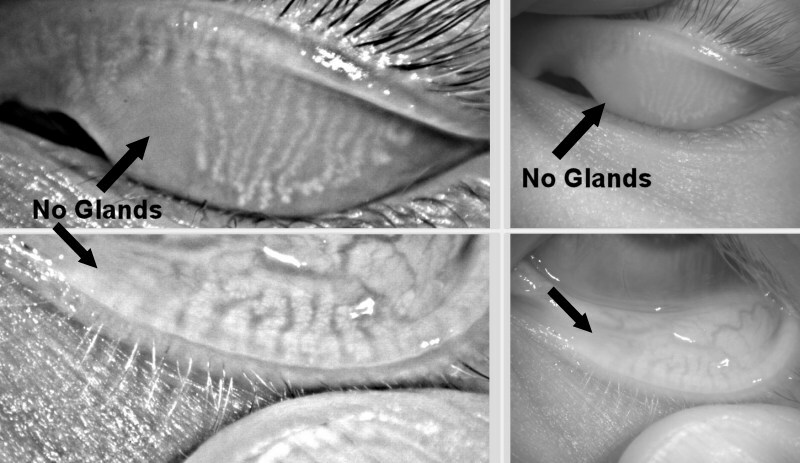 If these glands don't exist, then some part of the tear film may not be "protected" against evaporate, inducing quicker tear break up times. In the image below, the top lid shows a normal, banded pattern of meibomian gland distribution. The lower lid shows atrophy of the glands. Many LASIK patients who have suffered loss of quality vision and ocular comfort experience feelings such as depression, anxiety, anger, fear, guilt and loss of self esteem. For many these emotions have interfered with normal sleep patterns and have negatively affected their personal and professional lives. Many of my patients have expressed thoughts of suicide. One patient even attempted suicide on several occasions before I met her. One might describe the aftermath of LASIK gone wrong as a form of Post Traumatic Stress Disorder. Most of the damaged LASIK patients who I have treated are relatively young, under the age of 45. Many can no longer perform their jobs and as a result cannot support their families. Family life has been disrupted for many and divorces have occurred. There have also been at least 7 documented suicides directly attributable to their LASIK surgery. The eye is a highly unusual organ in that it is connected directly to the brain. The cornea, the part of the eye involved with LASIK is only 23 millimeters from the retina and optic nerve. In addition, there are millions of nerve fibers coursing through and around the cornea. No other body part involved with other elective, cosmetic surgeries shares this unique relationship with the brain. When other elective, cosmetic surgeries yield a bad result, the pain and suffering that this population will experience will not begin to approach the pain and suffering experienced by damaged LASIK patients. The great majority of LASIK surgeons are impotent when it comes with restoring vision and comfort in a non-surgical manner. It has been my experience that almost all LASIK surgeons want to do additional surgeries to correct a negative LASIK outcome. Sadly, I have seen too many patients hurt both physically and emotionally by a bad LASIK outcome. My first recommendation to these patients is to seek professional psychological help. Many of these patients find it difficult if not impossible to "let go" of their anger and guilt. These negative emotions can damage relationships with loved ones, friends and co-workers. My second recommendation is to find a competent eye care provider who specializes in the restoration of vision lost due to refractive surgeries such as LASIK without additional surgeries (or "enhancements"). There are now available new and exciting technologies designed to restore quality vision and ocular comfort. Major lens manufacturers and research institutions are investing heavily in developing additional technologies to address the many issues facing millions of hurt LASIK patients around the world. Do not give up hope. There are doctors who are devoting their professional lives to helping you function once again. In 2008, the FDA held a hearing on LASIK, its side effects, and their relation with depression and suicide near Washington, DC. The hearing followed a number of actual suicides. Several of these were presented by patients advocates who spoke at the hearing. The so-called "side-effects" which caused these suicides are the same side-effects that most LASIK patients complain about. According to the FDA's former lead research on Lasik, Dr. Morris Waxler (see HelpStopLasik.com), now lead Lasik whistleblower, the FDA never studied the severity of dry eye or higher order aberrations. In other words, the safety of Lasik was never really evaluated prior to its approval.